The Sports Cards Plus INVENTORY REDUCTION SALE ends Thursday, June 18th. Don't miss out on the savings. We had customers drive from the Texas Valley, Houston, Corpus Christi, and Dallas. We had customers fly in from Wyoming and California for our sale. Don't worry we have plenty more products at our LOWEST PRICES EVER, filled with Super Hits and their waiting for you. Due in this Wednesday, June 17th is 2015 Bowman Football with 4 Rookie Autographs and one veteran Jersey Card per box ($84.95 per box). Also due in Wednesday is Topps Series 2 Baseball. Hobby boxes are $54.95 and JUMBO boxes are $96.95. WARNING: The following pictures may make you jealous. They may leave you depressed because you didn't make it in to Sports Cards Plus, a.k.a. The Super Hit Factory for our INVENTORY REDUCTION SALE. Don't Worry! Our Inventory Reduction Sale is four more days and we always have more Super Hits waiting for you. Durell came in for our Inventory Reduction Sale and decided to try a box of THE NEW 2015 Prizm Draft Collegiate Football for only $54.95. 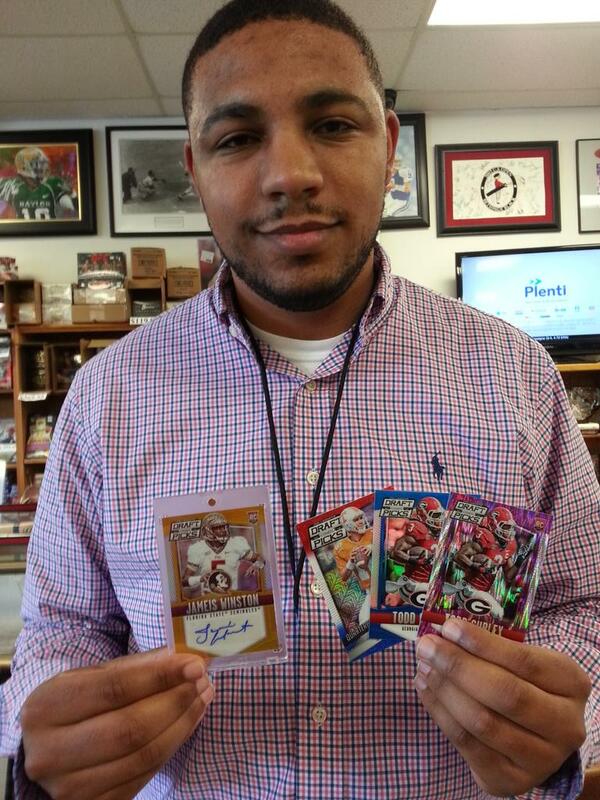 One good box led to another until his perseverance rewarded him with a Jameis Winston Gold Prizm Autographed RC #d/10! Ray and his son heard about The Legend of The Super Hit Factory from their home in California. They came to check us out and give a box of 2015 Diamond Kings Baseball a try. 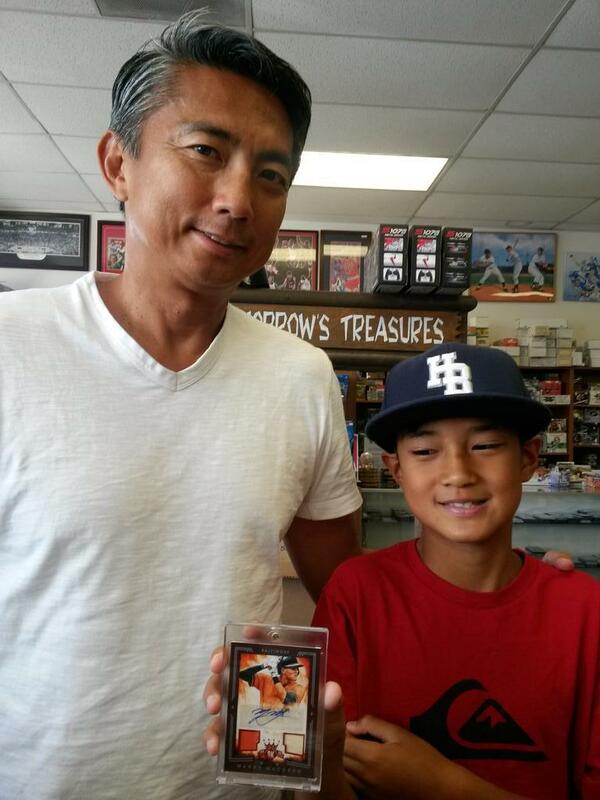 Here they are with their Manny Machado Autographed Jersey Bat Relic Card. Leland knows well The Legend of The Super Hit Factory. Today he decided to try a box of 2014 Bowman Platinum Asia Edition Baseball ($115 per box). 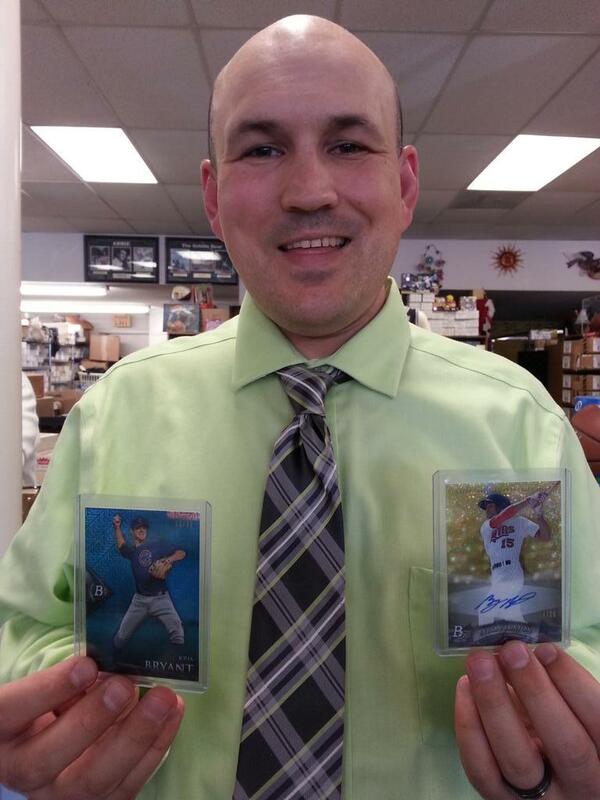 Here is Leland with his Kris Bryant Japan Refractor RC #d/35 and Byron Buxton Autographed Canary Refractor RC 14/15. Leland is a big fan of 2015 Topps Finest Baseball. He tried a box of Finest, now only $99.95 at The Factory. Leland pulled a Finest Mystery Redemption Autograph (player #2). Odds of pulling this card are approximately 1 in 762 boxes. Leland also pulled this Robinson Cano Red Refractor #d/5. Do like Leland and pick your box from The BEST CASES in The Hobby at the LOWEST Price in The Galaxy (all of Texas). Ben came in with Graduation money. He decided to pick his box of 2014-15 Immaculate Basketball from The BEST CASES in The Hobby. Guess what Ben was hoping to pull? Here is Ben with his redemption for an Andrew Wiggins Immaculate Basketball Autographed Jersey Patch RC. And, The Legend of The Super Hit Factory continues. Nate came in for our INVENTORY REDUCTION SALE. He found bargains throughout the store. Here are some of Nate's favorite hits. Chris is a Sports Cards Plus regular customer. Chris tried a box of 2013-14 Upper Deck Black Basketball. Here is the 10th Michael Jordan Autograph Chris has pulled at our store and the 150th Michael Jordan pulled at our store. Be like Chris. Go to Sports Cards Plus TODAY and pull your Super Hit. Don't forget our $500.00 Drawing is June 30th. Get a FREE Drawing entry matching your every purchase at Sports Cards Plus. So go to Sports Cards Plus TODAY and have some fun.